In Escargo’s own words:- My Life of Discovery. 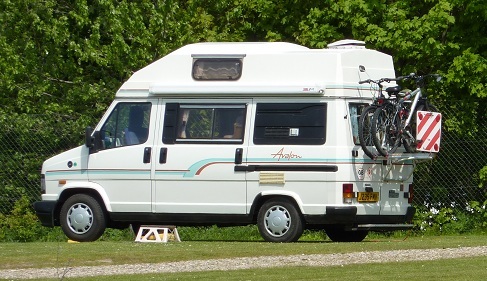 Although I entered this world in early 1992 as a quite basic white commercial delivery van, my life was very soon to be transformed for ever when I was taken to the family firm of Autohomes, down in Poole in deepest Dorset. Where, like a butterfly emerging from its larva, I became a rather (dare I say it) beautiful petite motor home. Without any input from me they cut giant holes in my sides then proceeded to remove my top. Then a team of white coated tradesmen increased my height with a smart new roof and let the light in with lovely opening side windows. Any thoughts of a quiet life were soon expelled when hammers, saws, plumbing and lengths of wood emerged on the scene. After what seemed an age but was probably only a month or so I was driven out into the bright sunshine to be greeted by looks and words of admiration by the outside world. Little did I know just how much of this wonderful new world I would be seeing. Over the years I acquired extra bits and pieces like cycle-racks, awning, internal lockers and shelving, all giving me an air of a proper little touring van. I think the badge of international acceptance was the G B sticker my later owners attached to my rear end ready for a new life of foreign travel. This couple, George and Sylvia, were my latest foster owners and boy was my life to change. First they came up with my name “Escargo”, not bad really as I suppose I was rather snail like with their travelling home on my back. What a fright the first time George drove me on the right hand side of the road, ( what’s he doing I thought ) I had some confidence that Sylvia would grab my steering wheel from him and put me back on the left side where I belonged but it didn’t happen. After a while we all settled down as every other vehicle was also on the wrong side of the road, so it kind of balanced out. Funny though, over the years they still haven’t learned to drive properly over there, perhaps they should move the steering wheel to the other side. Well after that first shake down trip on French soil (more shaking than tripping) the world, at least Europe, became our oyster. With those two just sitting back admiring the wonderful views whilst I purred along up mountain sides and along valley floors, taking them wherever they wished to go. Over the nine years that this young at heart couple had the pleasure of being my companions I took them over fifty thousand miles to nineteen different countries; from the top of Scotland one way, over to eastern Spain another, followed the not so Blue Danube to Vienna in far eastern Austria. Let them paddle in the cold Baltic Sea off Sweden’s far coast on a Scandinavian adventure. I showed them the breathtaking Lake Bled in Slovenia, the infamous road potholes of Hungary and the time forgotten places of the Czech Republic. I even got to experience the dramatic F/1 road track of Monaco (though not whilst the likes of Jenson Button and Lewis Hamilton were there). I took them so they could walk amongst the awesome snow-capped mountain ranges of Italy, Switzerland and France; stroll around the Black Forest valleys and gorges of Germany, and cycle the easy going woodland trails of the Netherlands. To mention all the countries would drain my batteries too much, suffice to say I think they enjoyed all the mini and not so mini adventures we have embarked on. Sometimes smooth as the babies proverbial sometimes not. One of the sometimes not so smooth trips nearly finished before it had even started, heading south down the M20 to catch the train at Eurotunnel Sylvia heard a noise like a stone or bolt rattling and bouncing along my underneath. Once at Eurotunnel, through check-in and heading to board our train there was an almighty banging around my offside wheel every time George, and I, braked. When Eurotunnels own breakdown service came out and jacked me up there were startled faces all round as my brake calliper etc. was only held on by two threads of one bolt and swaying freely; we now know what Sylvia heard on the motorway, the other missing bolt. Top marks to Eurotunnel, they refitted with new bolts and away I drove. The ironic thing was George had my usual garage replace all four of my brakes, including callipers, only weeks before, for his peace of mind as I was to carry my passengers over some of the highest and steepest mountain passes in Switzerland and Italy. Other hiccups to happen to me have been punctures, flat batteries and red brake warning lights staying on whilst high and alone in the Pyrenees. More than once they have had to park me up to allow my steaming brakes to cool. Another time, stuck behind a snow-plough lorry slowly going up the awesome Grossglockner Hochalpenstrasse in Austria, my engine overheated and my water boiled necessitating another enforced rest. All together though our trips together have been a huge success, enabling my two inmates to see sights they could never have dreamed of seeing on conventional breaks or holidays. Though I am of a fairly compact size of around five metres in length, my birthing family managed to find space to fit all the normal goodies you would find even in a larger motor home. At night my interior is transformed either into two singles or a double-bed still leaving full access to the rear half of my living area. This contains the galley complete with full gas oven, rings and grill, three-way fridge, sink unit, blown-air heat exchanging heater, two-way pressurised hot water system, wardrobe and shower-room complete with bench type loo and fold down sink. My fresh and waste water tanks are both of a good size. Outside the wind out awning gives them and me some welcome shade. Also, although they carry snow chains for my assistance (never used), they have fitted me with M & S (mud and snow not Marks and Spencer) tyres to make my grip a lot more steady when the going gets tough( could be a song title there). Even though I am quite a basic little motor home and slightly past my first flush of youth (I‘m still a goer returning 25 miles on a gallon of petrol). Not having power assisted steering or any of the other helpful abbreviations like ew, ac, cc, cl, abs and the like, I think I have given and will keep giving for many years to come many happy and thought provoking outings.